Monterey is Sea Hawk’s solvent-free antifouling formulation that is designed to give the best protection against all types of marine fouling, while remaining friendly to the environment. Monterey is a semi-hard, ablative finish that is easy to apply. It is compatible with most paints on the market and can be applied over most existing bottom paint in good condition. 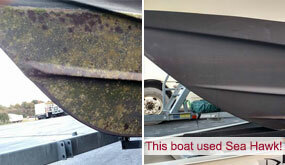 Monterey can also withstand removal from water without affecting its antifouling abilities.